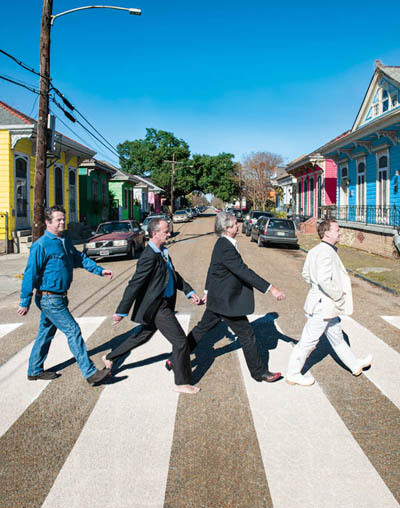 Formed in 2014, the Write Brothers are Spencer Bohren, Jim McCormick, Alex McMurray and Paul Sanchez, four of New Orleans’ finest songwriters who have traveled very different roads to becoming critically and commercially acclaimed tunesmiths and performers. With over a century’s worth of experience between them, the Write Brothers have rendered songs in the genres of rock, folk, blues, country, and rhythm and blues. 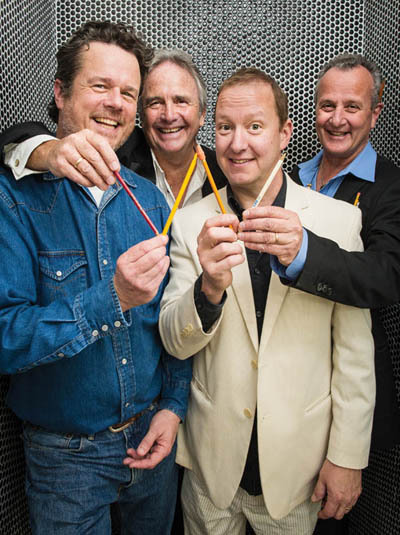 These four distinct voices find common ground in their love of songwriting and of performing. Their debut album, First Flight (Threadhead Records), is available now. In January of 2010 Off Beat Magazine awarded Paul Sanchez three Best of The Beat Awards: Songwriter of The Year, Best Song of The Year, Best Folk/Rock Album for Stew Called New Orleans, his duet record with friend and collaborator John Boutte. In April of that same year Gambit Weekly awarded him Best Roots Rock Performer at The Big Easy Awards. Sanchez has written songs for Darius Rucker of Hootie and The Blowfish, The Eli Young Band, and Irma Thomas. Paul resides in the Treme neighborhood with his wife Shelley, where he sings and breathes everything New Orleans. 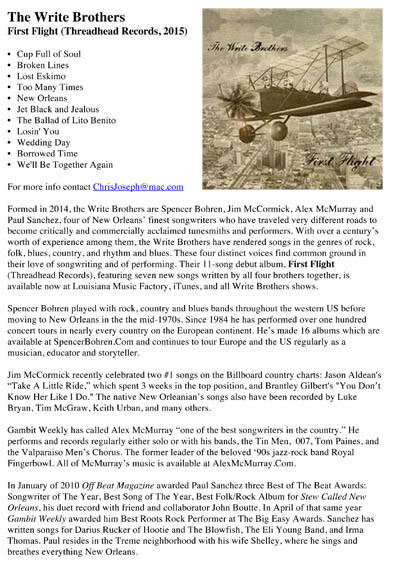 Guitarist and singer Alex McMurray has been writing and performing music professionally in New Orleans for 25 years. Past and current bands include Tin Men, The Valparaiso Men's Chorus, Royal Fingerbowl, 007, Debbie Davis and the Mesmerizers and Happy Talk Band. He has released three CDs of his own music, and has worked as a sideman with Paul Sanchez, Johnny Sansone, Ingrid Lucia, "Papa" John Gros, Lynn Drury and many others. He spent six months performing sea shanties as "Cap'n Sandy" at Tokyo DisneySea. 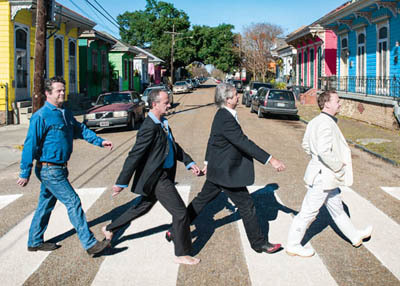 Awards include a 2014 Big Easy award for best Roots Rock and 2010 Big Easy award for Album of the Year. He was seen and heard on the HBO series "Treme" several times. He is currently keeping busy with his many projects, including "The Write Brothers. 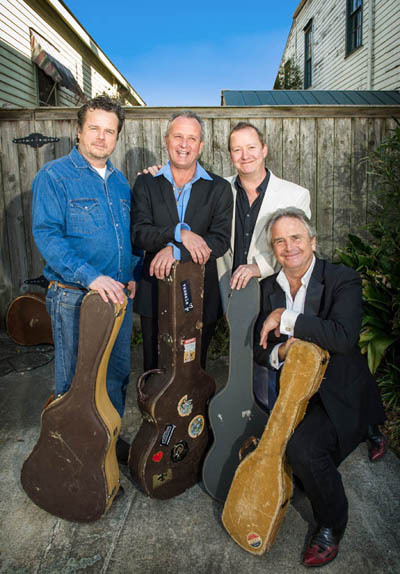 Spencer Bohren played with rock, country and blues bands throughout the western US before moving to New Orleans in the the mid-1970s. Since 1984 he has performed over one hundred concert tours in nearly every country on the European continent. He’s made 16 albums which are available at SpencerBohren.Com and continues to tour Europe and the US regularly as a musician, educator and storyteller. These hi-res photos are available for download and publication. Click to view and download. Credit: Elsa Hahne.